The McKinney area welcomed its first settlers in 1842 and developed rapidly prior to the Civil War with livestock and agricultural crops including corn, wheat and oats. In 1849, McKinney incorporated after being designated as Collin County’s seat in1848. Official boundaries were designated in 1859. As families began settling in the area, churches, transportation, education, and culture naturally followed. In the 1850s, schools were established and furnished by the Masonic lodges in Collin County. Collin County’s first newspaper, the McKinney Messenger began in 1858. One of the first known hotels was built and run by Capt. Joe M. Bounds, a Mexican War veteran who died in 1863 as a Civil War colonel. The first railroad, the Texas and New Orleans, came to McKinney in 1872 and that same year saw the present stone courthouse replace an earlier wood building. 1883 brought the first telephone exchange in McKinney, and 1886 brought electricity to the town. Not all of McKinney’s development was so civilized. The rock building housing Collin County Prison was constructed in 1880 and held the usual drunks, thieves, rabble rousers and the occasional murderer. Throughout the 1890s, gunfights were common at the Parlor Saloon and in 1890, a man was killed there. Still, life in the 1890s was, for the most part, somewhat predictable for McKinney’s residents. With good credit, a family could charge its groceries and dry goods. There was little serious crime, so most people didn’t bother locking their doors. Capt. Benjamin Franklin Houston (born January 7, 1830 in Mississippi to a prosperous farming family and owners of numerous slaves; died April 21, 1902 in McKinney,Texas and Martha (Driver) Houston (born December 23, 1824 in Mississippi and died October 1, 1899 in McKinney, TX) were married on April 2, 1853. They welcomed their sixth child , Cebe Alec Houston on February 12, 1869 in Abbeyville, Mississippi. Cebe entered the grocery business as a young man after moving to McKinney, TX, where he met his wife to be, Alma Frances Hill. They were married on December 16, 1896 at the home of her parents, Mr. and Mrs. D. C. Hill. Alma ‘s mother, whose maiden name was Field, had many siblings in McKinney, including her sisters Mrs. Lucy Delaney and Mrs. Henry (Field) Barnes, whose son was Joe W. Barnes. Joe was a grocery delivery boy as a youth, a McKinney grocer for many years and served as City Commissioner under Mayor Henry Finch. On April 27th , 1899, a loan for the newly built house with wraparound porch at the comer of College and Lamar was obtained from Cebe’s father-in-law for the amount of $600. Cebe and Alma had $300 cash in hand for the down payment, bringing the total paid for the house to $900. The mortgage was to be paid in two payments of $300, each on the next two anniversary dates of the loan. At some point, Cebe ‘s parents moved to McKinney. Martha died shortly after her son and daughter-in-law’s purchase of 615 W. Lamar, and Benjamin’s death followed only two years later. Benjamin and Martha are buried side by side at Pecan Grove Cemetery. 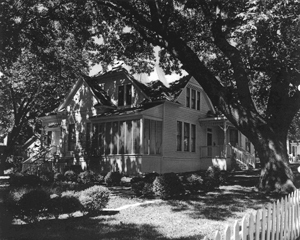 The Houston family lived in the home until early 1902, when they sold it to Dr. and Mrs. Rucker. Sometime after, the Houstons left McKinney and moved to 3531 Hall Street in Dallas , where Cebe was a member of East Dallas Christian Church, a Shriner and a 32nd Degree Mason. He returned regularly to McKinney to visit his brother, Dr. D. F. Houston, who lived at 308 N. Church Street and was at his brother’s home when he passed away on June 7, 1940. There is no mention of children born to the couple. He and his wife are buried at Pecan Grove Cemetery. Wilford Ervin (W. E.) Rucker was the first born child of William R. (of Scotch ancestry) and Mahala (Underwood) Rucker, on May 10, 1863 in Cleveland,Tennessee. William was a farmer and merchant who had served in the Union army during the Civil War. He and Mahala were both Tennessee natives. W. E.’s older brother, William Henry Rucker, moved to Nevada, Texas in Collin County in the 1880s and was not only a successful merchant (Rucker & Taylor), but also served as Nevada’s postmaster. W. E. graduated from Vanderbilt University Medical School in 1892, then completed post graduate courses at New Orleans Polytechnic. He began his practice in McKinney, TX, but after a short time moved to Dallas, where he practiced for four years, returning to McKinney in 1900. He set up his office at 105 W. Virginia and was active as an Odd Fellow, an Elk and a Mason. McKinney’s Masonic Lodges, now known as St. John’s #51, were responsible for placing and dedicating the cornerstones on the square’s courthouse building, the City Hospital and the Christian Church, these square stones being a symbol of morality and truth . Dr. Rucker was also active in the affairs of the Collin County Medical Society for many years. He was one of the best known and most well liked physicians in North Texas, serving as the official doctor on call for the western terminus of the Louisiana Railway & Navigation Company, as well as the Houston and Texas Central Railway. Though not a surgeon, he became recognized as the most noted diagnostician in North Texas during his many years in Collin County and is said to have been loved and respected by the thousands who knew him. Following the Rucker’s purchase of 615 W. Lamar, Sanford Maps show that the original footprint ofthe house with its three sided porch did not vary until 1914, when changes included the south facing section of porch being replaced with a stoop and steps leading to the backyard. He and his wife Fannie McMurray Rucker (born in Georgia in 1861to Professor and Mrs. (Holt) McMurray) welcomed only one son to the family, William E. (Willie) Rucker, born in 1895 in McKinney. Willie met and married Frances Abernathy about 1916 in McKinney and had one child, daughter Fannie Jim Rucker, born in 1917. Later that same year, Willie died of pneumonia at the Naval Training Center while preparing to serve in World War I. In 1923, Dr. Rucker’s health declined due to issues with his heart, and he began limiting his practice in advance of eventual retirement. On Saturday, January 5, 1924, Dr. Rucker left his office at the usual time in the afternoon and walked home, but about seven o’clock, complained of feeling unwell. Physicians were called, but despite their aid, Dr. Rucker passed away at his home about ten thirty Saturday night. He was buried at Pecan Grove Cemetery. In 1937, Fannie McMurray Rucker passed away and was also buried in Pecan Grove Cemetery. Their house was conveyed to their granddaughter, Fannie Jim Rucker, by now married to Rhoades Alderson, on January 24, 1941. She and her husband sold it to Clyde L. and Arlyn B. Fagg on January 25, 1941 for the sum of four thousand one hundred dollars. Clyde L. Fagg was born on December 20, 1909 and his wife Arlyn was born on November 9, 1911. After purchasing the home in early 1941, the Faggs owned the home for less than two years before selling it to Joe and Bessie Anderson for the sum of three thousand nine hundred and fifty two dollars and seventy five cents. On December 10, 1942, the Andersons gave cash in hand of fourteen hundred fifty two dollars and seventy five cents, and were also responsible for paying the remaining twenty-five hundred dollars still owing Collin County National Bank by the Faggs. The Faggs lived in Austin and Dallas, then at some point moved to DeSoto, TX, where Clyde died on July 27, 1994 and Arlyn on September 28, 1996. Joseph and Bessie lived in the home for many years. In May 1948, a tornado complete with hail, heavy rain and 100mph winds roared through McKinney, causing damage to hundreds of businesses and homes, including 615 W. Lamar. The brick chimney had crumbled and was not replaced. The tornado had also caused the house to shift on its foundation, making years of numerous foundation adjustments necessary. Their son Dillon, who won the Legion of Merit award for his service in the Army during World War II, went on to become an attorney in Houston. He also served as the U. S. National Security Advisor from 1955-1956. After her husband’s death, Bessie Dillon Anderson lived in the home until her own death in 1967. On March 17, 1968, according to the terms of her will, she deeded the property to C. Avery Mason, the Bishop of the Protestant Episcopal Church for the sum of ten thousand dollars. After holding the property not quite two years, on January 16, 1970, the Diocese of Dallas decided to approve sale of the property to John A. and Jane A. Warden for the sum often thousand dollars. At the time the Wardens owned the property next door, 609 W. Lamar, and purchased 615 W. Lamar as a rental property. In the 1970s, the Warden family refashioned 615 W. Lamar as a duplex and much of its original character and charm was destroyed. Part of its large lot was sold to build a small cottage behind it. When the General died, his son and daughter-in-law received the house and continued as the landlords. Decades of use as a rental property followed, complete with patched up electrical, plumbing and miscellaneous careless repairs. Neighbors remember the once elegant original Eastlake porch being torn off after decades of neglect and being replaced with only a small stoop. In 2002, the Wardens sold the home, though it continued to be used as a duplex. When Mr. and Mrs. Jared Gilbert purchased the home in 2002, they left it as a duplex for some time, then when their renter vacated, they hired an historical architect to ascertain where the walls had originally been located, with plans to restore it to a single family residence. In taking down the sheetrock walls surrounding the staircase, the original stick and ball banisters of the stair case were revealed,in need of repairs but still splendidly accurate to its era. The downstairs was determined to have had a long center hallway, a shorter hall on either side, a parlor with fireplace and French doors leading to the original porch, and a large dining room with lots of light from tall windows. A kitchen (with beadboard walls and ceiling and schoolhouse pendant lights) and bedroom, a study (with original pocket doors) and two baths completed the downstairs. Twelve foot ceilings and Eastlake style moldings around doors, windows and floors appear to be original, though patched in spots due to walls being moved. The downstairs floors are hardwood and the tiger oak mantel in the living room/parlor is trimmed with salvaged Victorian tiles found in the crawl space under the house. Two and a half bedrooms and a full bath are upstairs. The Gilberts built a carport and gravel driveway at the rear of the house to provide parking. Mr. & Mrs. Jim Ryan purchased the home in December of 20 10 and began repairs months before moving in. Due to a break-in before their move , the first repair was to the original cottage style stained glass front door and then the installation of an alarm system. A foundation company found that there were no piers at all providing support for the dining room, so that was an early addition. A water conserving irrigation system followed, along with the gutting of the master bath due to water damage from years of patched up DIY plumbing. A new bath with ceilings restored to 9′ height, hexagon tile floor, subway tile shower with Victorian style shower head, reclaimed oak medicine cabinet, and reclaimed pedestal sink with separate hot/cold faucets was installed. Floor joists in one of the upstairs bedrooms had deteriorated and had to be replaced. The wall to wall carpet was removed from the hardwood floors downstairs and they were refinished along with the pine floors upstairs. Most of the original lighting fixtures were long ago stripped from the house and replaced with reproductions or home improvement store fixtures. The current owners are scouring antique lighting stores to locate, rewire and install fixtures appropriate to the age and style of the home. A recent find is a circa 1890-1900 combination gas/electric chandelier, currently being rewired for the dining room. The Ryans are also enthusiastic about restoring the wraparound porch to the home. Though previous owners did not report ghost activity in the house, the Ryans’ 35mm photo of an upstairs bedroom during their initial tour of the house shows an orb. You be the judge. The Houston-Ryan home has miraculously survived a tornado, years of abuse and neglect, haphazard ‘remuddling’ and a nearby church’s plans to raze it to build a parking lot. It is a proud Eastlake-Queen Anne Victorian, in need of tender loving care to restore it to its former finery. Mr. and Mrs. Jim Ryan are seeking a City of McKinney Historical designation for the home. One need only view the throngs of out of town visitors to the shops, restaurants and entertainment venues of historic downtown in any given week to know that much of McKinney’s prosperity is owed to the dedication of historic preservationists here. The Ryans’ intention is to preserve another period architectural example of how our historical past is still contributing to the vibrant, growing community that is McKinney, Texas.